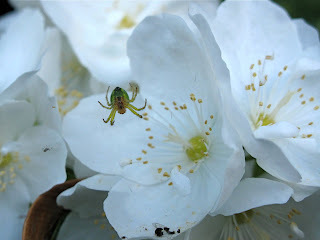 This tiny bright-green spider (Araniella sp.) is usually wonderfully camouflaged amongst the bushes and low vegetation where it spins its web. 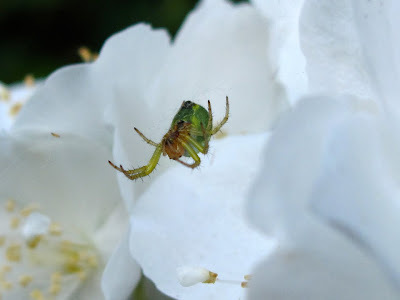 This female, however, is laying in wait, with open arms atop a cluster of white Philadelphus flowers and was easy to spot at a distance. There is some debris from her meals at the bottom of the photo below, revealing that small flies and aphids flying past form part of her diet. 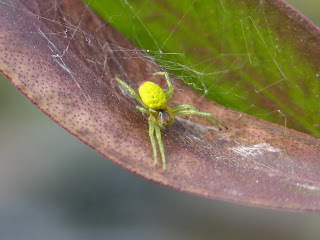 The following photo is a dorsal view of a female of the same species.